Despite supposedly unbreakable promises to myself, I usually don’t manage to get outside for some fresh air during the day. Lunch time and afternoon coffee offer perfect excuses to get out for 10, 20 minutes or even an hour. And yet, somehow I just don’t keep those promises to myself. I find a website to pore over, or more work to do, or whatever. The few occasions I have forced myself to leave my chair have been prompted by the fact that I have a camera with me, especially if it’s a nice day out. On leaving home this fine Friday morning I grabbed the camera to force myself to take such a break. I took our older camera as it’s lighter and smaller (though it’s not light or small) than the SLR. The SLR takes much better pictures, for sure, but sometimes you just don’t need to be carrying that extra weight. Having worked through lunch, I forced myself up and out of the office to walk off some post-eating sleepiness. I wandered past the library, past the carillon tower and through a small garden. Small birds tweeted in the trees and shrubs around me with not a hashtag in sight. I spied a pair of tiny birds investigating a lichen formation in a tree and stopped to get a closer look. I took one photo (they were very hard to see in the viewfinder) to aid with later ID but all I got was part of a head. Walking on a bit further I spied two unusually-silent crows – one asleep, the other keeping watch with a wary eye. Next stop was the Museum of Anthropology where I walked around the outdoor exhibits. 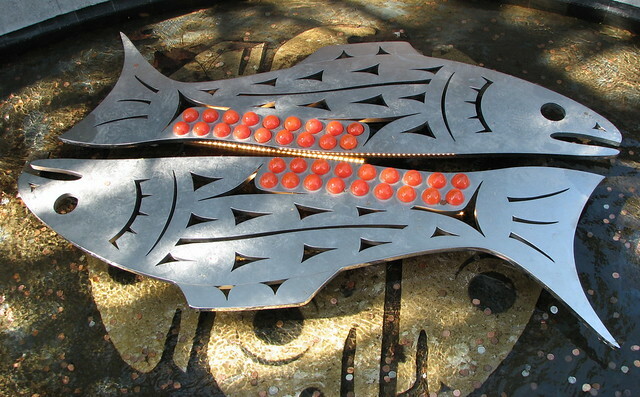 The museum underwent a series of renovations recently and part of that seems to include a great new salmon sculpture near the entrance. Two salmon, with bellies full of orange eggs, in a small pond. Very cool. I walked around the back of the museum, pausing briefly to watch and listen to a pileated woodpecker in a nearby tree. I looked at the totem poles and cedar houses with new eyes after seeing the `Beyond Eden’ production about the removal and shipping of the poles from the village of Ninstints in Haida Gwaii to UBC. I walked through a new art installation composed of small plastic boats and found a rock to sit on overlooking the Burrard Inlet and the cloud-capped mountains of the North Shore. I could have sat here all day in the warm sunshine. I checked my watch and decided it was time to move on. I stopped to explore the old gun battery from WWII and then walked back to my desk. 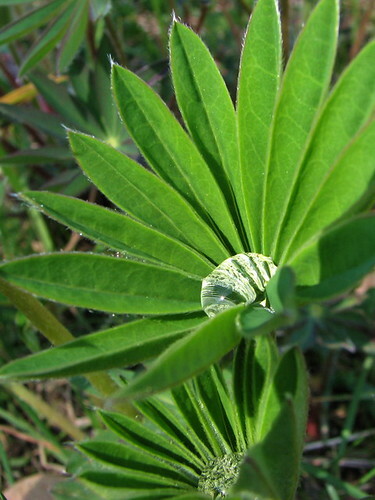 I found one more thing to take photos of: new lupine leaves were beginning to decorate the sides of a grassy bank and in one or two, drops of water had accumulated. I need more excuses like that.